This program was created in order to educate students about opportunities outside of the traditional path of accounting to Big 4. While an accounting degree isn’t necessary for all roles in the Finance and Internal Audit Divisions, speaking the “language of accountancy” allows employees a transferable skillset that is applicable across a variety of teams or roles. Starting their careers with us allows students to jump directly into the dynamic financial services industry and apply their accounting interests to the real world. 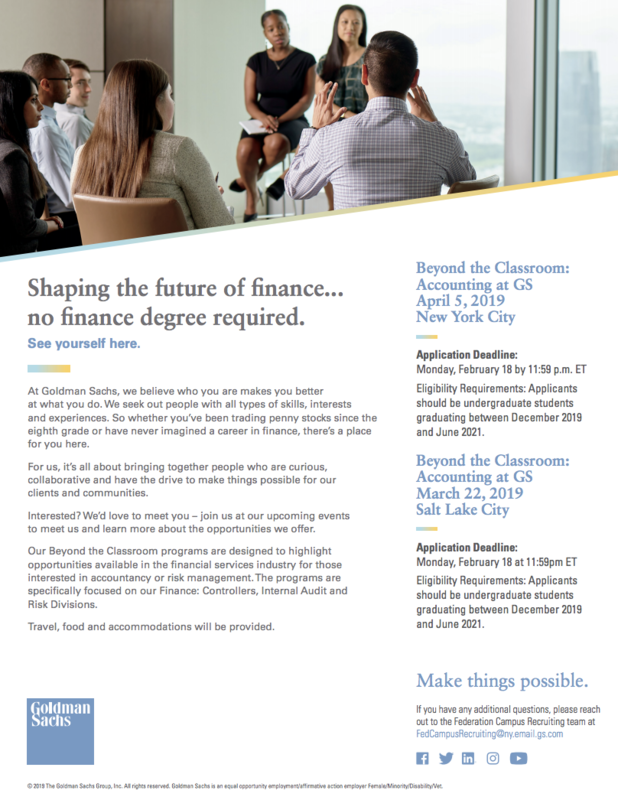 By attending BTC, students will learn more about the Finance and Internal Audit Divisions, network with professionals and see our offices first-hand. 1. Submit an application through our events portal at www.goldmansachs.com/careers/events. Search each event by name to apply. 2. Complete all questions contained in the ”Inbox Task” that you will receive once you apply on the events portal. Stanford Women In Business February 12, 2019 BCG, Aspire M.E.